When the first bell rings at 7:45 a.m. at Stockwell Elementary School, faculty and teachers await for faces to arrive in their classrooms. Lessons plans are written and supplies are laid out anxiously awaiting eager hands and minds to use them. One specific Stockwell Faculty member, Kim Howell, will always greet them with a smile, a hug and a lot of willingness to help them learn. Not only does she go above and beyond for her students at Stockwell but she helps set a standard for librarians across the state. So, how did she get selected as School Librarian of the Year? 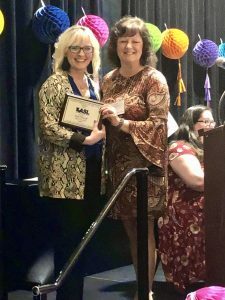 The LLA (Louisiana Library Association) says, to be selected as School Librarian of the Year, the librarian must have demonstrated through action and philosophy a dedication to the mission and goals of the profession. To show that Kim Howell was the best librarian in the state, there was an application process. In addition to the application, she had three recommendation letters, one from her nominator, her supervisor and one from a teacher that she collaborated with. She also gave her resume and evidence of each of the ten selection criteria. Her being selected as School Librarian of the Year has to do a lot with her day-to-day impact on the lives of students she comes into contact with, as well as the teachers. On a normal day, she teaches, with her fellow librarian Kari Johnson, 36 Pre-K through 5th grade library classes with an A/B weekly schedule. “Our typical day is overwhelmingly filled with reading to and with student patrons, makerspaces (such as chess, checkers, magnatables, coding, kindness rocks, puzzles, STEM centers, etc.) 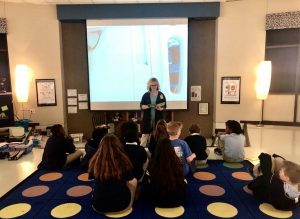 ‘spalding’ (phonogram) sounds, sign language, self check-out, perusing for book selections, mindfulness exercises, movement with music, researching, creating a mosaic sticker by sticker, and so much more,” Howell said. Though Kim Howell has not always been a librarian, most of her working career has dealt with children. She started her education career in 1994 at Apollo Elementary School teaching third grade. She then obtained her certification in kindergarten and taught kindergarten for five years. 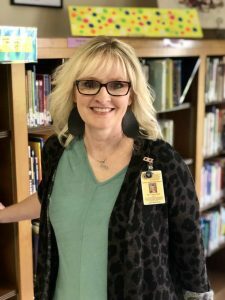 Once she returned to Stockwell, she taught fourth grade for 9 years and during those teaching years, she earned her certification in Library Science. This is Howell’s 8th year serving as a librarian and her passion for students and reading is evident. The skills students are learning at a young age will help them in their adult life. Howell has been impacting these lifelong learners for years and doesn’t plan on stopping any time soon.